The Glenwood Hall was constructed in 1951 by local farmers and neighbours, putting in many volunteer hours to create a place for social gatherings and community affairs. This facility is owned by the Glenwood Women’s Institute and managed by the Glenwood Hall Committee. The Hall is a community facility available to rent for recreational, cultural, community and private uses. 2x 100 cup coffee percolators and 4x 30 cup percolators (2 of which are for hot water only). You do not need filters but will have to provide coffee. The Driftwood Schoolhouse was built in 1944 to replace the original Driftwood School log building that was constructed in 1920 and destroyed by a fire. The schoolhouse served the surrounding area of Driftwood and to a smaller extent Glentanna with an annual enrollment ranging from 12 to 26 pupils in grades one through eight. The school closed in 1965 and was eventually sold to the Glenwood Hall Committee in1989 for $5000. The Driftwood School Restoration Committee was established in 1990 in response to the suggestion that the school be torn down due to its poor condition. Through the committee and endless support from the surrounding community, the Driftwood School has remained open, hosting numerous community events over the years. NOTE: The Driftwood School does not have indoor plumbing or water! Rent the Hall, the Schoolhouse…or both. The Glenwood Hall and the Driftwood Schoolhouse are unique side-by-side venues that share a field — 1/3 of the field belongs to the Glenwood Hall and the other 2/3 belongs to the Driftwood Schoolhouse. Parts or all of the field may be used for overnight camping by renters depending on which venue you book. If you want access to all the facilities and all of the grounds, you will need to book both venues separately thru the 2 separate booking forms (see buttons below). Click the arrows to scroll and view through the months. 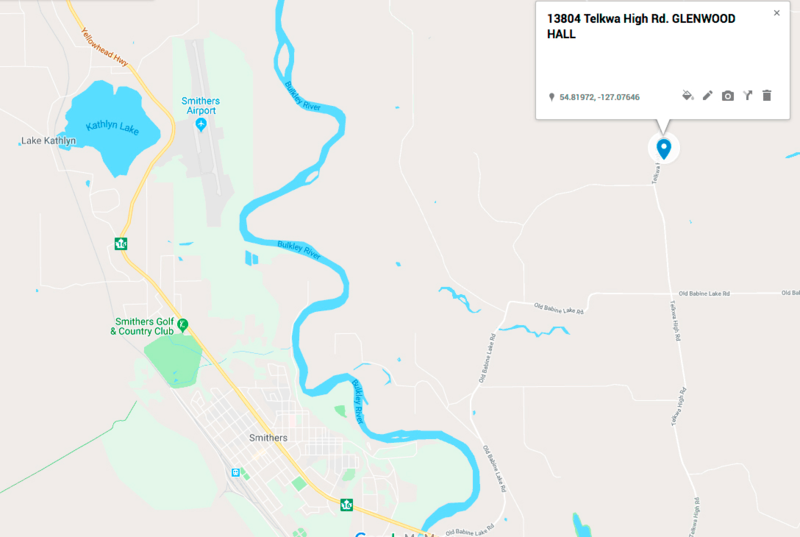 The civic address for the GLENWOOD HALL is 13804 Telkwa High Road, Smithers BC. The DRIFTWOOD SCHOOLHOUSE is next door, on the corner of the Telkwa High Road and Driftwood Road.